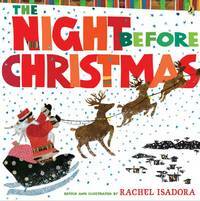 The gorgeous reimagining of the classic Christmas tale with Rachel Isadora's signature twist! Caldecott Honor winner Rachel Isadora sets her colorful, unique version of this well-known Christmas poem in Africa, capturing the anticipation and excitement of the holiday in her stunning collages. Children will pore over the enchanting artwork--brimming with special touches like traditional African toys and a Santa who sports dreadlocks--as they chime along with the familiar rhyming text. Puffin Books. Used - Very Good. Great condition for a used book! Minimal wear. Puffin, 2012-10-11. Original. Paperback. Good. 2012-04-04. Good. Ships with Tracking Number! INTERNATIONAL WORLDWIDE Shipping available. May not contain Access Codes or Supplements. May be ex-library. Shipping & Handling by region. Buy with confidence, excellent customer service!